This is our edition of the 1616-edition of Ambacht van Cupido by Daniel Heinsius. In this introduction, we have limited ourselves to the essentials. Daniël Heinsius was born in Ghent, a town in the southern Netherlands, in 1580.1 He lived there for only three years. His parents then fled from the Spanish Inquisition, and Heinsius was consequently raised and educated in the northern Republic. After his studies at the Franeker and Leiden universities (where his father wanted him to study law, while Heinsius himself was devoted to the classical literature and philosophy), Heinsius started working as a classicist in Leiden. As a professor, he edited many Latin and Greek works and composed Latin and Dutch poetry, almost right up to his death in 1655. First published in 1613 as sequal to Heinsius's Emblemata amatoria, the Ambacht van Cupido (The trade of cupid) was reprinted in 1615, 1616 and 1619, as part of an enlarged edition of Emblemata amatoria. A number of undated editions survived as well.2 For the edition of 1613 an unknown artist made new, oval picturae for Heinsius's first set of love emblems (allready printed in 1601 and 1608 and then titled Quaeris quid sit amor (see: [Titlepage]) and Emblemata amatoria (see: [Titlepage])). The picturae for the new collection named 'Ambacht van Cupido' resemble the style of Vaenius's Amorum emblemata, in the sense that they are also set in an oval shaped frame. The 1613-plates were again used for the 1615-edition. slightly restyled (given a retangle shape); by this time, the plates seem worn out. The engravings of the 1615-edition are of poor quality, and this could have been the reason the a new set of plates was made for the 1616-edition. In the 1616-edition of the Ambacht van Cupido, digitized on this website, the two sets of love emblems were again combined and published in a larger volume with poetry by Heinsius titled the Nederduytsche poemata by Heinsius. In fact, the title 'Ambacht van Cupido' only appears on the titlepage of the 1615-edition of Heinsius' love emblems. It is used on this website to indicate the difference between the first and second set of love emblems by Heinsius. In the 1616-edition of the Nederduytsche poemata the section of love emblems is announced by a blank page with the title ’Emblemata Amatoria’ (see: [Titlepage]). The two collections of love emblems in this section of the book are separated by subtitles at each page, namely 'Ambacht van Cupido' and 'Emblemata van Minne'. The 1616-edition of the Nederduytsche poemata was published by Willem Jansz.. For this occassion, Heinsius's poetry had been collected by his friend Petrus Scriverius (1576-1660), who had worked with Willem Jansz. before. In the preface to the book Aen den Leser (To the Reader), Scriverius explains that the 48 love emblems in the book are gathered from the 1613-edition of the Ambacht van Cupido as well as the 1601/1608-editions of Heinsius's Emblemata amatoria The first set of Heinsius's love emblems were, as Scriverius claims, really not the product of Heinsius's own imagination. They were gathered by a 'liefhebber' (lover of poetry) from the work of for instance Hadriaan de Ionge. 'Dan alsoo dit maer stomme beelden waeren, soo is de soet-vloeyende tong van onse Poëet daer toe geleent.' (Since these [=the images provided by De Ionghe and others] were nothing but silent images, Heinsius, our sweet-writing poet, lent his pen to them to provide them with words). 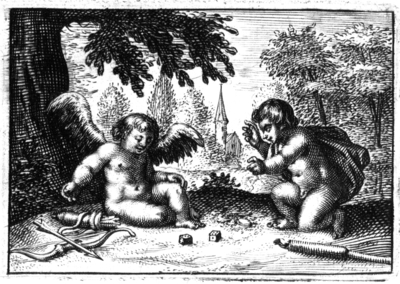 the church, positioned in the middle of the two cupids playing dice, does not appear to be a neutral element in the background. Its central presence assures the reader's attention, and seems to hold an additional message. Came full of glad good cheer to Holland's prosperous towns. Left scatterings of silver dewdrops here and there. Could spend some time with me to learn our Holland tongue. He tries to walk on ice, he wears a pair of skates. They'll keep him firm, he thinks, and steady on the water. It's easy to fall down, or even right straight through. Will lose their footing fast, their love will come to nil. 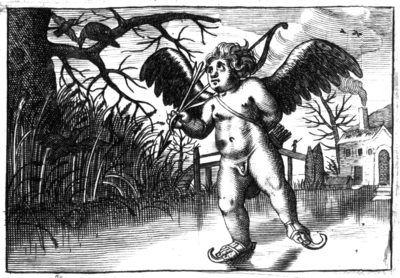 Heinsius now claims that Cupid, during his stay in Holland, learned more than just the Dutch language. In passing, the god of love also mastered the skill of ice-skating. The Netherlanders - inventors of the "skating game" - taught him how to skate on their frozen canals. In the pictura we see a Dutch winter landscape and the typical wooden skates of the Low Countries. In gaining mastery over the slippery ice, this emblem suggests, Cupid also learned the fine points of the art of love. The situation in love is no different from that on the ice. Like skating, the game of love seems deceptively simple, but can only be learned by trial and error - by falling, getting up and trying again. Now that Cupid has learned from the Dutch experts how to stay on his feet on the ice, he can be considered truly accomplished in the art of love. Heinsius may have employed this positive image of the energetic, skilled Dutchman to counter the idea current elsewhere in Europe that in the cold, wet climate of the Netherlands only people of a crude, unrefined sort could thrive. The point here would then be that only in the Netherlands did Cupid truly learn the fine art of loving. By 1613, in Het ambacht van Cupido, Heinsius could speak with authority. With the addition of the 24 emblems of the Ambacht van Cupido to his collection of love emblems, Heinsius also went a step further in the realistic settings against which Cupid performs. The little god of love is pictured besides windmills, he skates on little Dutch canals, and he plays typical Dutch games. In preparing this edition of Ambacht van Cupido we have used the copy of the Nederduitsche poemata of the Utrecht University Library, shelf number AB: Moltzer 1 C 15. The full text has been transcribed and encoded using TEI mark-up, to allow for flexibility in presentation and non-destructive editorial enhancement of the text. The full project guidelines for transcription, editorial intervention and indexing of the text are available elsewhere on this site. The full Emblem Project Utrecht bibliography may be accessed using the top menu of this window. A selection of literature relevant to the Ambacht van Cupido follows here. Landwehr, Emblem and Fable Books , nr. 292.